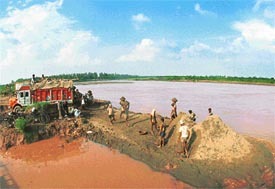 Quarrying by an unbridled “politician-contractor mafia” on the bed of the Ghaggar has not only caused erosion of fertile land along its banks but also lead to diversion in the course of the river. Illegal quarrying on the bed of the Ghaggar has caused rapid soil erosion and loss of cultivable land at Rampur village, near Chhat Bir. — Photo Karam Singh. Parents and relatives of students involved in recent brawls at the Panjab University campus are paying a “heavy price” for “misdeeds”of their wards. They have been made to wait in police station for hours and even kept under ‘watch’ for no fault of theirs. On the afternoon of July 26, a youth from Panchkula was challaned for driving a scooter with “tinted glasses” in addition to driving without safety helmet, near Housing Board traffic light points. 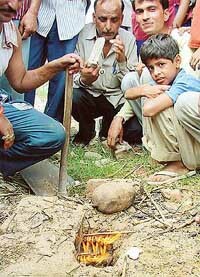 A chance discovery of methane gas around the dumping ground of Chandigarh has led to protests from nearby residents. It has startled the Chandigarh Administration into action. This evening, the Additional Deputy Commissioner, Mr Inderjit Singh Sandhu, visited the area and got it cordoned off. For security purposes, police personnel have been posted and a fire engine has been posted. The gas has been emanating for a long time and residents have been even misusing it. Some residents of the nearby Dadu Majra village have even laid pipelines and use it as cooking gas. The confessional statement made by two key witnesses in the corruption case involving two judicial officers may break new ground in the CBI investigation. 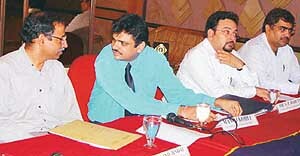 The statements of Paramjit Singh, Superintendent with the Labour Court, and Satinder Singh, alias Babu, clerk, and the report of the Central Forensic Science Laboratory (CFSL) on cassettes containing conversation between judicial officer S.S. Bhardwaj and complainant Gurvinder Singh Samra, have become the main evidence for the CBI. The corruption case involves Jalandhar District and Sessions Judge R.M. Gupta and Judicial Magistrate (First Class) S.S. Bhardwaj. The World Health Organisation (WHO) has undertaken a project to ascertain the extent of antibiotic resistance in India. The project started in collaboration with the Union Ministry of Health, is to be conducted through eight centres across the country. The PGIMER, Chandigarh, is one of them. After years of teaching labour laws and ways to improve the productivity to the workers and members of managements in the organised sector, the Centre has decided to shift its focus to the workers in the rural and unorganised sector. An estimated 35 crore workers are employed in these sectors in the country. Harry Potter is back, along with Walt Disney’s Uncle Scrooge and Mickey Mouse. Even Popeye the sailor man, and his girlfriend, Olive have found their way out of the television screens. 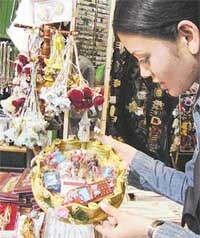 They are all being sold in the card and gift shops all over the city in the form of rakhis. This is not all. For the first time, perhaps, in this part of the region, threads for “bhabis” are also being offered. Popularly known as “loombas”, these colourful threads with tiny ghungroos attached can be had for Rs 75, even less. The Chandigarh Administration today decided to reduce the number of polling booths in the city from 641 to 417. This has been done following guidelines issued by the Election Commission, according to which there was a need to change the criteria laid down for deciding the setting up of polling booths, since the electronic voting machines had increased the speed of voting. Members of the Chandigarh Chapter of the Institute of Chartered Accountants of India has urged the government to simplify the process of Tax Deduction at Source (TDS) by introducing one form for all categories of tax payers. This issue was raised at a seminar on TDS and taxation of educational institutions, organised by the institute . Ms Neena Aggarwal, a resident of Sector 7 here , has been selected for judicial services in Uttaranchal. This was the first batch of judicial services in Uttaranchal and Ms Neena has secured second position among the girl candidates . She has been a top ranker throughout her academic carrier. The supreme head of the Indian Orthodox Syrian Church, Moran Mar Baselios Marthoma Mathews-II, was given a warm welcome on his first visit to the city by St Mary’s Orthodox Syrian Church in Sector 46 today. With the new Administrator of UT Chandigarh, taking charge, the Rent Act issue has surfaced again. Negating the outcomes of the rent notification viz., upward swing, the real estate, boost in construction activity in the region-generating employment, lower rentals and widespread settlements in majority of the disputes resulting in considerable decline in rent litigations, the commercial tenants, in the garb of a newly formed body, are singing the old tune of rolling back the notification. Following the death of Mr Ravinder Chopra, president of the Chandigarh Club, all entertainment programmes in the club have been cancelled till the Uthala ceremony which is take place on Sunday. CITCO employee Budhi Singh was strangled to death on the night of August 6. This was revealed in the post-mortem report of the body. The police has registered a case under Section 302 of the IPC. The students of Sri Guru Gobind Singh College for Women celebrated Teej on the college campus in Sector 26, with all its traditional trappings, giving a modern twist here and there. 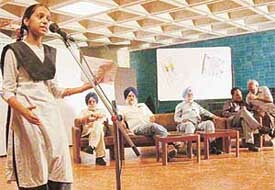 The Punjabi Kavi Mandal, today arranged a special poetic symposium at Shivalik Public School. Parkash Utsav of Guru Harkrishan was observed at Sri Guru Harkrishan Model School in Sector 38-D today. Students and staff presented a programme of “shabad gayan” on the occasion. A resident of Maloya, Amod Kumar Singh, was today sentenced to five years’ rigorous imprisonment in a case of kidnapping of a minor girl. The accused was convicted and also fined Rs 500 by the UT Additional and Sessions Judge, Mr R.S Baswana. A Kharar court today remanded Amar Bedi, Director of Amarjot Drug De-addiction Centre, here to two days of police custody. Bedi was arrested by the Mohali police yesterday following allegations by the centre inmates that he mentally and physically tortured them as part of their treatment. During the past few years, fielding of overage players has given a bad name to the city football. Three players of the Chandigarh Football Academy were found to be overage last year.